You may have heard at least one of these mobile terms before--jailbreaking and rooting. Both terms belong to mobile phones and tablets. Both jailbreaking and rooting are methods that will give you unrestricted or administrative access to your mobile device's entire file system. Jailbreaks refer to Apple iOS devices (iPhone, iPad, iPod touch) while rooting refers to Android devices. It's basically the same thing, but different terms for the two mobile operating systems. 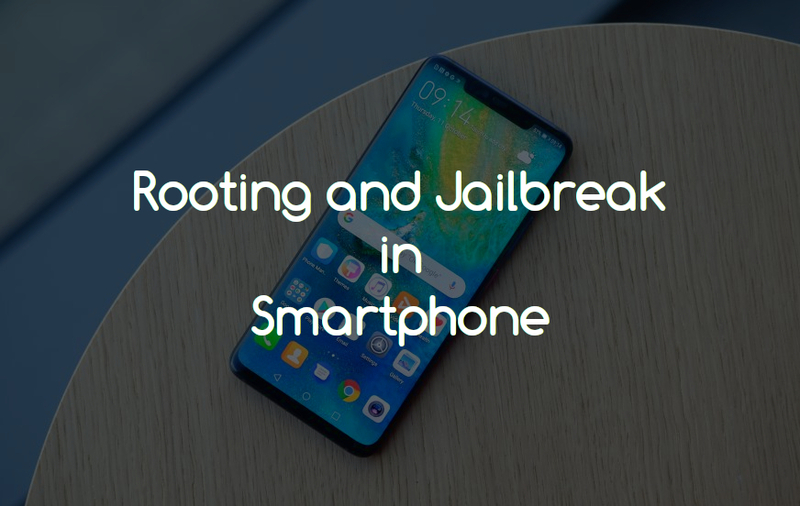 Nowadays, jailbreaking and rooting are all ways of bypassing their limitations, and doing things that manufacturers and carriers don’t want you to do. Some countries have laws that prevent you from doing these things with the devices you paid for and legally own. Here, in this post, exploring some important information about these two methods. Android is an open source operating system and allows you to do much more than just install 3rd party apps. Android out of the box allows users to install third-party apps (also known as sideloading), already allows you to install themes, and even allows you to install applications directly from your SD card or internal memory of your device. So on an Android device, rooting basically gives you access to more or less the entire operating system. You can completely remove the OS and replace it with user made operating systems that contain tweaks and enhancements (known as ROMS), and you can even access and adjust settings such as your processor speeds. The process is allowing users to attain privileged control (known as root access) over various Android subsystems. As Android uses the Linux kernel, rooting an Android device gives similar access to administrative (superuser) permissions as on Linux or any other Unix-like operating system such as FreeBSD or macOS. Rooting gives the ability or permission to alter or replace system applications and settings, run specialized applications that require administrator-level permissions or perform other operations that are otherwise inaccessible to a normal Android user. On Android, rooting can also facilitate the complete removal and replacement of the device's operating system, usually with a more recent release of its current operating system. Root access is sometimes compared to jailbreaking devices running the Apple iOS operating system. Jailbreaking generally refers to Apple iOS devices (iPhone, iPad, iPod touch). It's the process of removing the limitations put in place by a device’s manufacturer. Jailbreaking removes the restrictions Apple puts in place, allowing you to install third-party software from outside the app store. Some people may have the perception that jailbreaking is only used for piracy, but this isn't the case. Jailbreaking allows you to do things like change your iPhone’s default browser and mail client. Essentially, jailbreaking allows you to use software that Apple doesn’t approve. This process can be performed on other devices with similar limitations. Apple doesn’t want you jailbreaking to get past a device’s limitations - so you can change the default programs on iOS. To perform a jailbreak, someone has to find a security vulnerability that allows them to “exploit” the device and get around the manufacturer safeguards. How to Root or Jailbreak your device? Although they might seem like scary, complicated methods, jailbreaking and rooting are fairly easy to do, with tools like JailbreakMe and SuperOneClick. For Android phones/tablets, in particular, you'll want to make sure the rooting method is compatible with your particular device. Also, before doing any of these methods, make sure you've backed up your device or at least saved all the important data on it, and have it fully charged and plugged in. On an Android smartphone, administrator rights can be legitimately obtained with the manufacturer’s approval. Here is how this is typically done: users must type their smartphone’s unique number (IMEI) and download the necessary software. It will unlock the smartphone’s bootloader and enable the upload of a modified operating system that will grant a user’s full rights. To have your smartphone rooted using this type of vulnerability, you need either to connect it to a computer using a USB cable and launch an application on the computer, or start the program on the phone. In a few minutes’ time, your phone will be rooted, and you will not have to repeat this procedure in the future. And for the iOS device, Jailbreaking an iPhone/iPad is also based on exploiting vulnerabilities. Typically, jailbreaking is performed by connecting the iPhone to a computer and running a program on the computer; however, there are easier ways to jailbreak older devices. Some time ago, there was an enormously popular website, Jailbreakme, which exploited a vulnerability in the Safari browser. With this site, users could gain full privileges on their iPhone/iPad with a single click by accessing this website from the device and clicking on the “Jailbreak me” button. Later on, Apple patched this breach and hired the site’s developer. Prudence pays, it seems. The main consequence of performing a root/jailbreak is the installation of additional management programs, which offer new functional capabilities. For iOS, the “gold medal” is the emergence of Cydia, an alternative app store; for Android, the proof of success is the emergence of the SU or SuperSU application. Though Jailbreaking and rooting both processes are not illegal, but they void your device warranty. They also are different from unlocking your phone. There are risks involved with jailbreaking and rooting. For one thing, these technically void your warranty, so if something's wrong with your phone after you jailbreak or root it, the manufacturer won't honor the warranty to fix it. Another issue is that your device can be more vulnerable to malicious apps and you can possibly harm your device during the rooting or jailbreaking process. The solutions to those two issues are to be very careful about what you install on your phone and only use rooting and jailbreaking methods that have been thoroughly tested for your device and operating system. Rooting/jailbreaking has very serious security implications, but keeping away from such practices does not guarantee your security. Attackers can take advantage of a vulnerability on your smartphone and obtain administrative rights for their malicious application without using intermediary programs like SuperSU. An unlocked device is typically stripped of all warranties, so nearly all future problems will have to be settled at the user’s expense. It is your decision whether it is worth doing or not. You can share your valuable experiences with us in the comment section. Thank you!